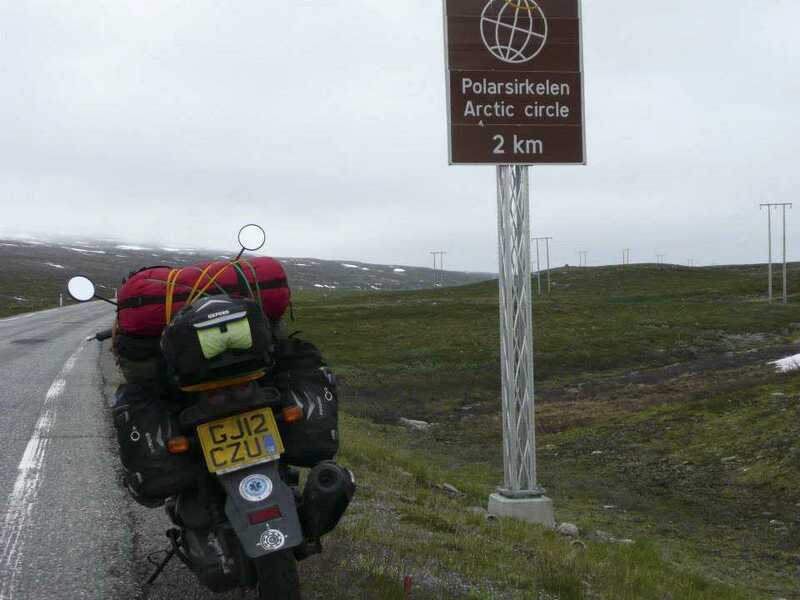 With the increasing popularity of adventure bikes and an ever shrinking globe, it’s becoming more and more difficult for tales of momentous two wheel journeys to capture the public’s attention. 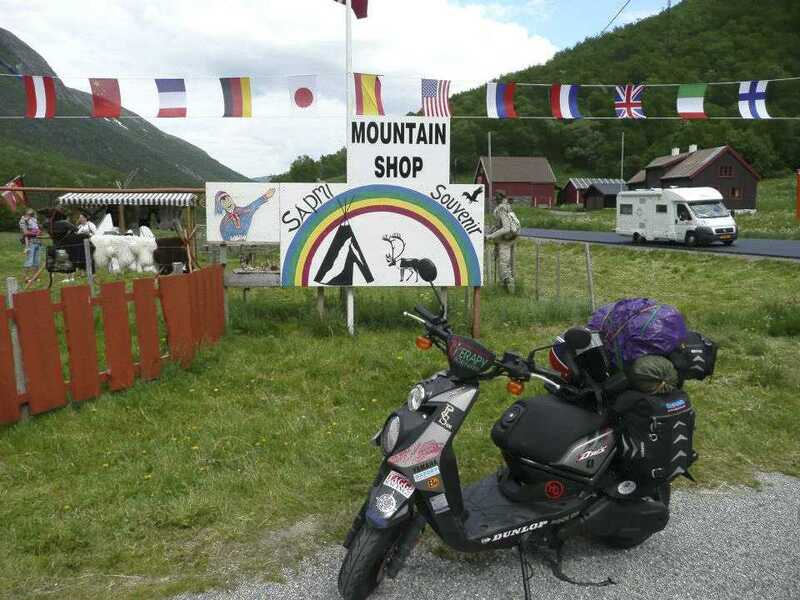 Especially when the rider doesn’t venture far from the highway, preferring paved routes to hazardously traversing of fast flowing rivers, or miles of ploughing through deep mud on a chunky behemoth. Adventure journeys need a USP to make them stand out from the rest, whether it’s the risk element, the sheer foolhardiness of it all, or just that you can’t quite believe that somebody would have the cojones to set off on such an audacious expedition. 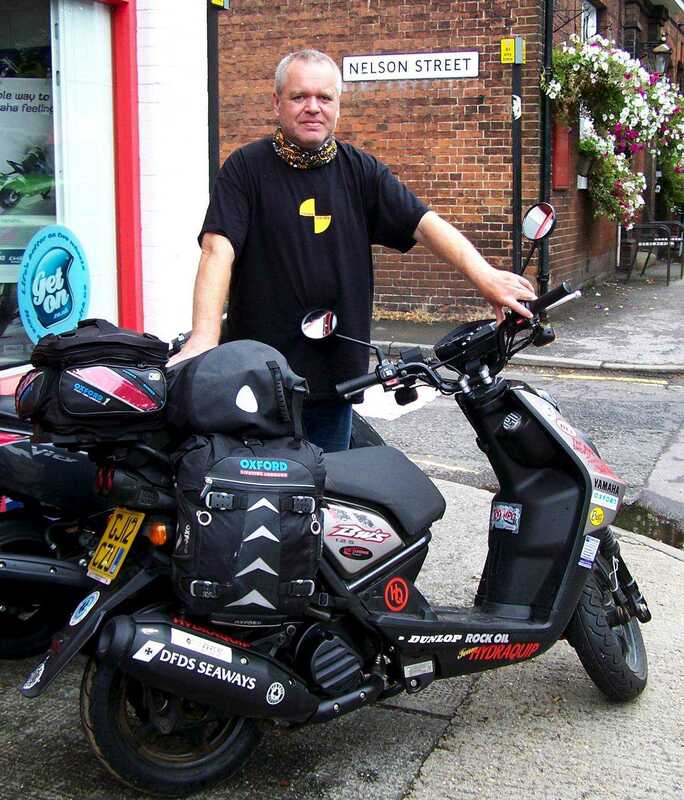 The latter is the case with Steve Taylor, an MS sufferer who was planning to ride from Canterbury to Andalucia on a step thru the last time I spoke to him. 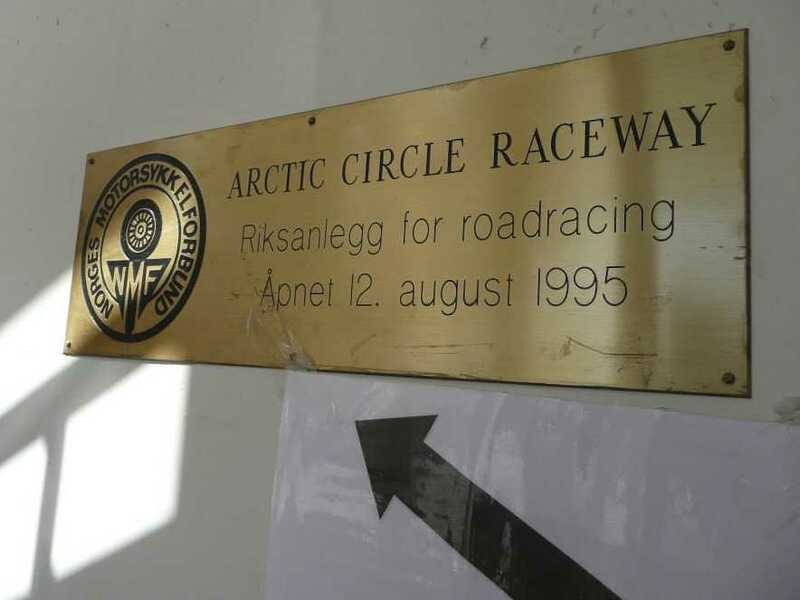 I first met Steve at the International Long Track (Grass Track) Championships at Swingfield, near Dover last summer – see issue 183 – when organiser Graham Hurry told me I should talk to “a guy with MS who rode a scooter across the Arctic Circle”. As a result of that meeting I later interviewed Steve at the base of one of his sponsors, The Bike Shop in Faversham and asked him how the trip came about. 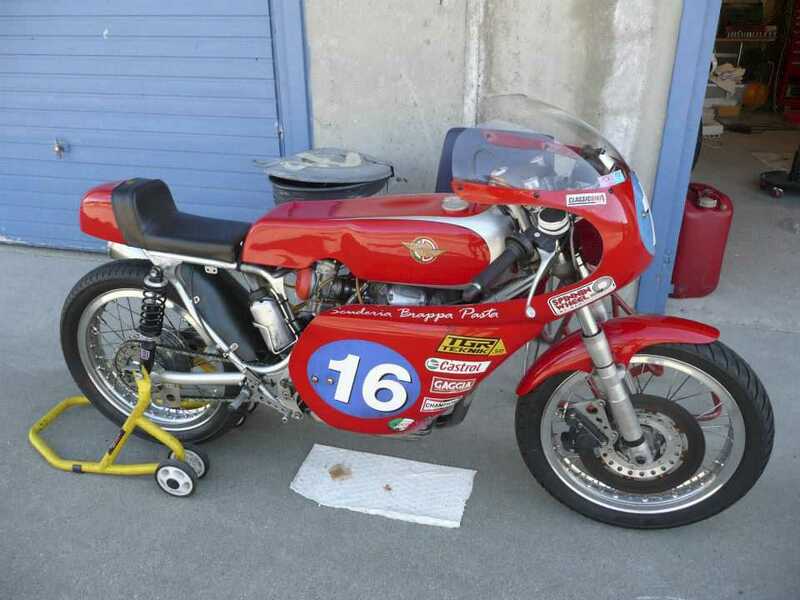 Steve Taylor had been a bike mechanic specialising in suspension and working in British and World Supersport racing. He’d also worked in British and World Superbike but found Supersport more competitive. In 1999 he was working at a race meeting, when a colleague asked if he’d had a few too many beers the night before because as Steve himself says, “I was walking funny, my legs more or less stopped working”. Steve had been playing rugby off-season and a scrum collapse had damaged his neck, initially his doctor suspected that this was what was causing the problem with his legs. 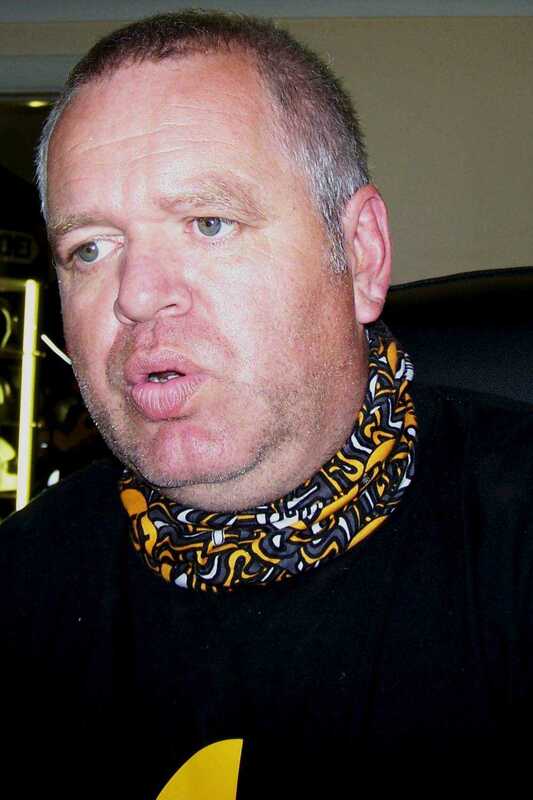 However, after a number of MRI scans Steve was diagnosed with Multiple Sclerosis. For the uninitiated, Multiple Sclerosis (or MS) is a chronic neurological disease that attacks the central nervous system. The symptoms are variable and unpredictable, sometimes causing a numbness and weakness in the limbs, but more severely causing paralysis or loss of vision. Steve suffered a severe attack of the disease for the following two years but later went into remission for several years. In 2007 Steve was in Jerez working on a Spanish team’s race bikes during the winter. To enable himself to walk properly he had become used to injecting himself with steroids. Unfortunately this is thought to have eventually caused an embolism, which travelled to his brain, wiping out his memory overnight. “I couldn’t speak, I didn’t know where I was, it was pretty bad.” Steve was forced to retire from racing. 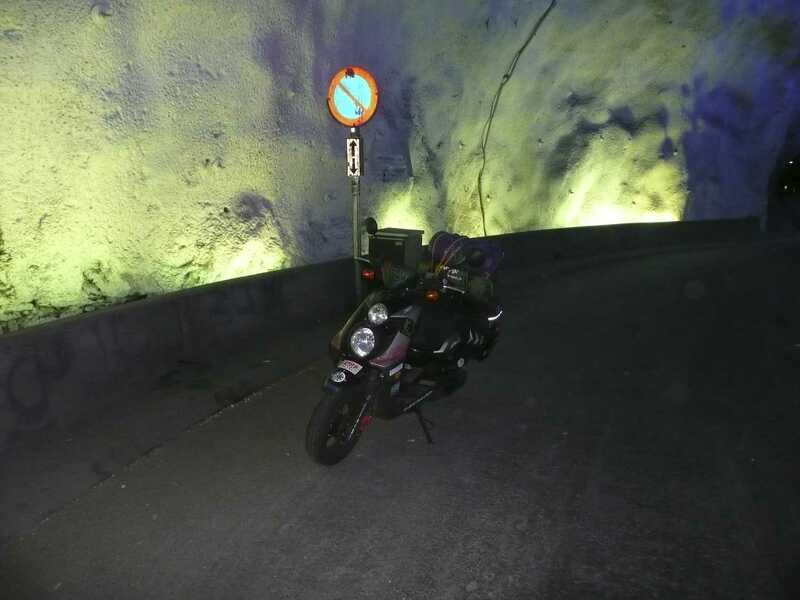 He became interested in scooters when he wanted to continue riding but problems with numbness in the left side of his body made using the clutch and gear changing difficult on a conventional machine. 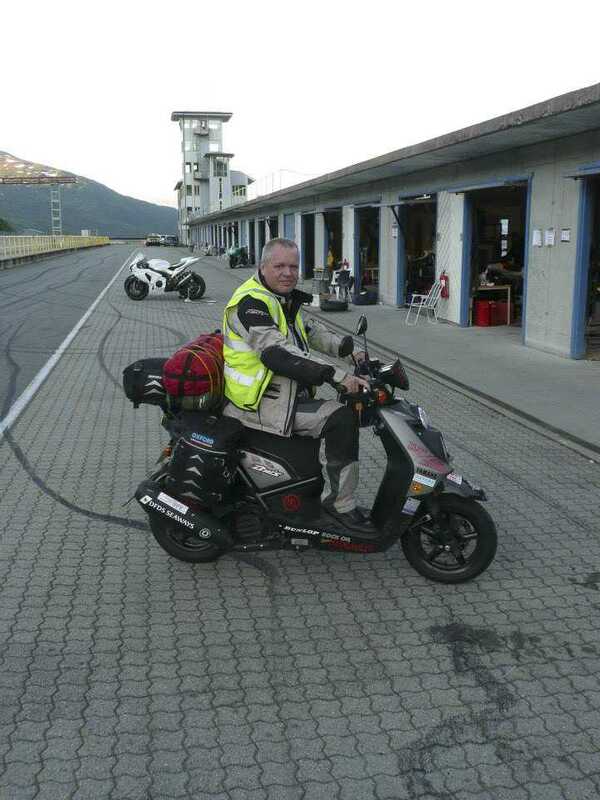 Steve’s love of long distance scootering came from when he was working with the Aprilia team in 2004 at Circuit Paul Armagnac near Nogaro in southern France. “There was an air traffic controllers strike” remembers Steve, “so no planes were taking off or landing in French airspace. I had to get home.” Steve suggested to the team boss that he would ride home on a paddock bike. The team boss told Steve that if he rode home on the 50cc Aprilia scooter he could keep it. Steve attends the Kent Multiple Sclerosis Therapy Centre, based in an ageing building in the corner of Canterbury Rugby Club’s car park. 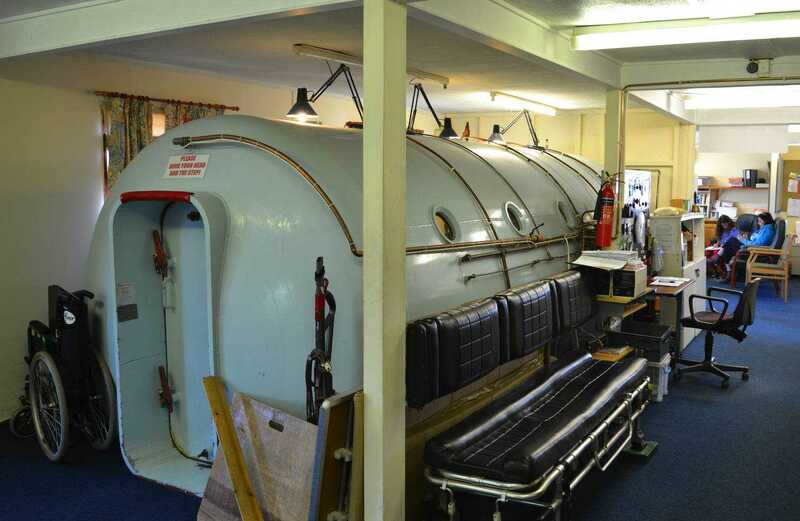 The Centre has been running an appeal to raise £1,300,000 for a new building to house its facilities, which include a huge hyperbaric oxygen chamber, which as well as proving beneficial to some MS sufferers can also be used to treat divers suffering with decompressions sickness – the bends – and patients effected by carbon monoxide poisoning. Steve was considering how he could use such trips to raise some money for the MS Society, when his nurse suggested that he raise much-needed funds for his local centre. 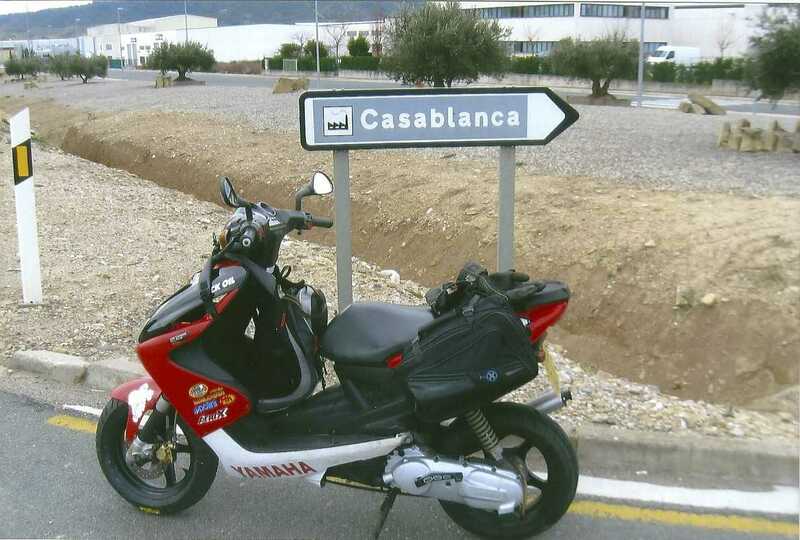 Steve’s initial journey was a ride to Casablanca, to raise funds for the centre as well as increasing awareness of MS. He made the trip on a Yamaha Aerox 50, a former paddock bike. 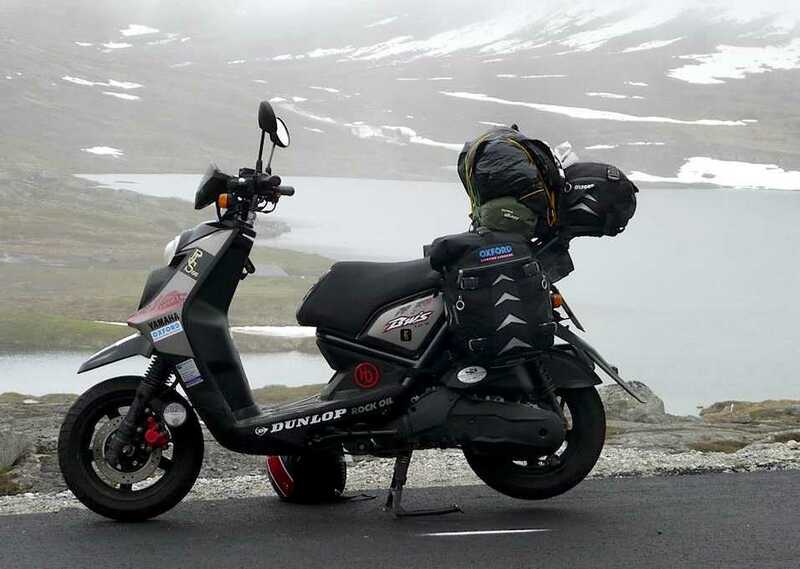 With the help of scooter specialists PM Tuning, the 19-day 6,000 mile round trip was completed without the bike missing a beat. 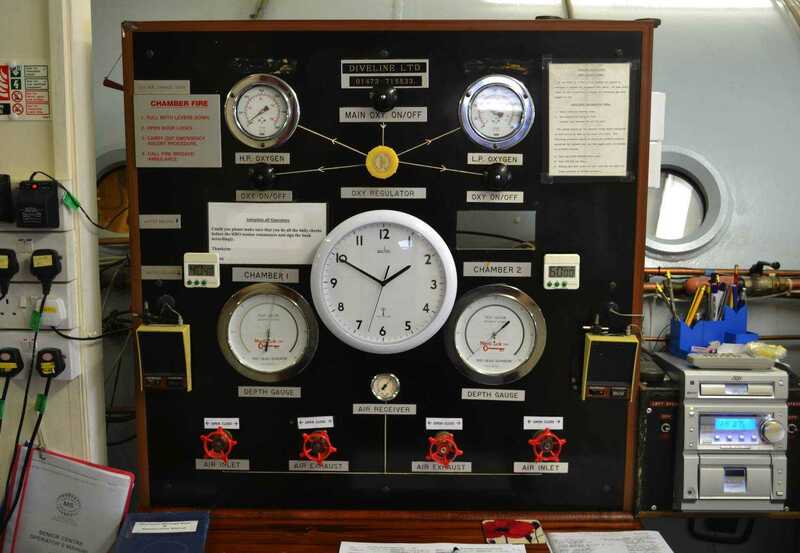 With an arrangement in place with sponsors DFDS Ferries, Steve is able to book crossings with just a phone call, which goes a long way towards removing the pressure posed by time constraints on the journey, so Steve doesn’t usually have any idea of how long each trip will take. Steve crossed the Pyrenees and the Atlas Mountains in the snow, but some of his toughest challenges came when he entered Africa. 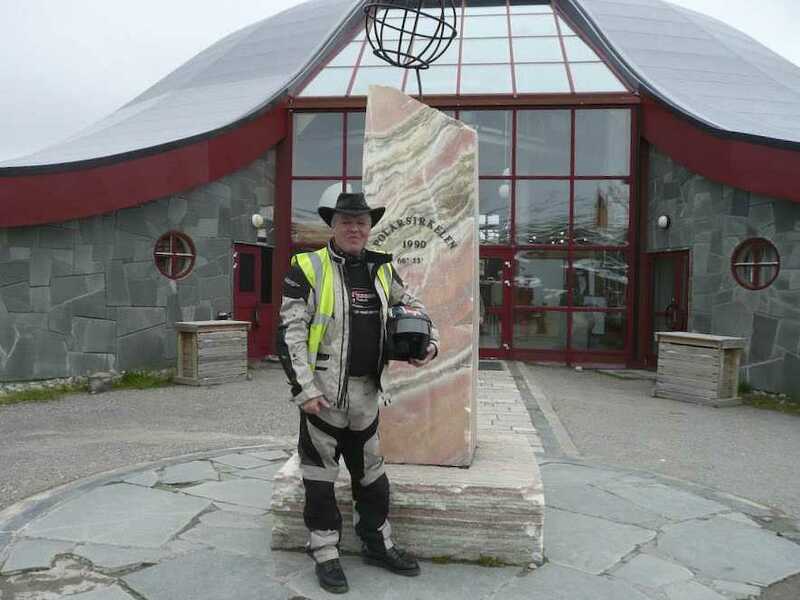 Steve succeeded in raising a considerable sum of money for the centre, but was soon thinking of his next venture, a 5,500 mile trip across the Arctic Circle. With sponsorship secured from major names such as Dunlop, Oxford Products, Coleman and RST, Steve sells a sticker spot on his scooter for £100. 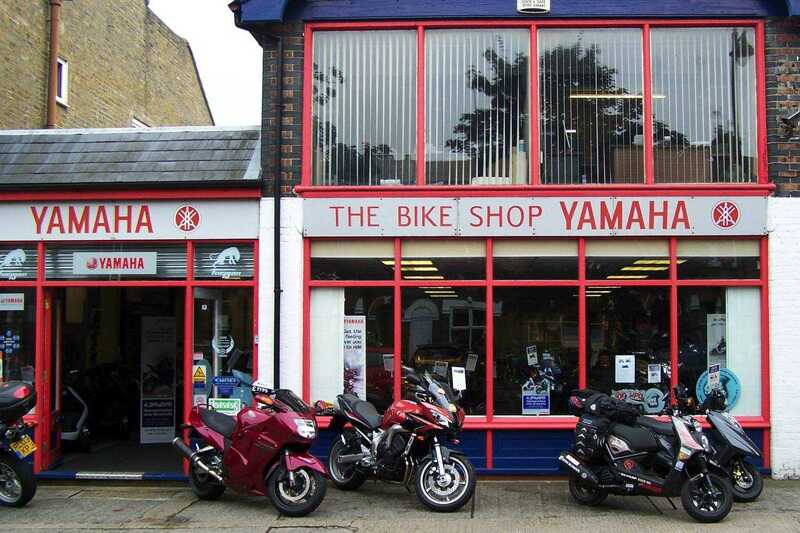 On speaking to Tony Dunderdale of The Bike Shop in Faversham, it was decided that a Yamaha BWS 125 four stroke would be a more suitable machine, which Tony then generously donated. After the previous luxuries afforded by hotels and staying at friends’ houses Steve decided to that only way to keep costs down was to camp, either on official sites, or at the side of the road, taking packs of MX3 dehydrated food supplied by Tradewinds Outdoor of Faversham. The journey began in June 2012 with a blessing for his bike from Canon Clare Edwards at Canterbury Cathedral, he was also given a script from the then Archbishop of Canterbury Dr Rowan Williams to take to Tromsø Cathedral in Norway, a round trip that took in France, Belgium, Holland, Germany, Denmark, Sweden, Finland and Norway during the following six weeks. The unpredictability of Steve’s disease is always a factor that he has to keep in mind. 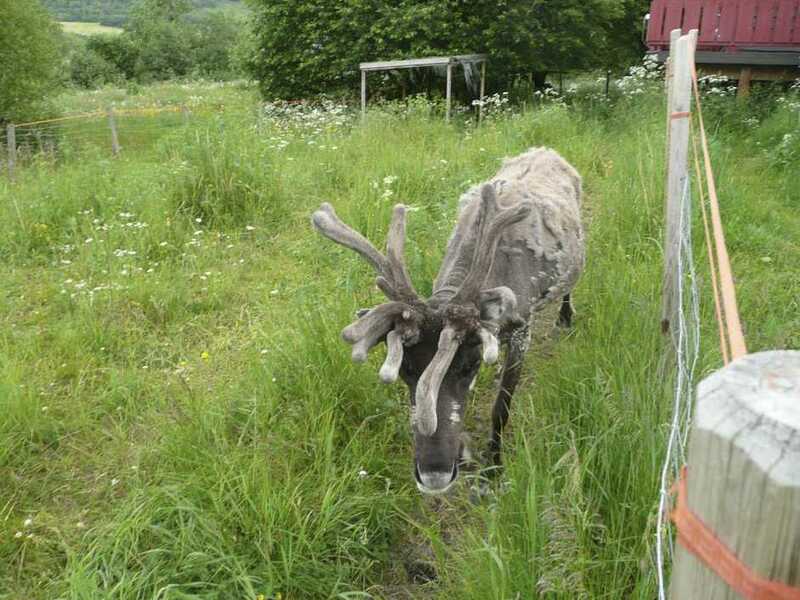 In Tromsø he suffered a relapse and decided to take a break for a couple of days. Although he had recovered sufficiently to ride, an attendant in a petrol station noticed that his speech was still slurred and called the police, resulting in his being breathalysed. 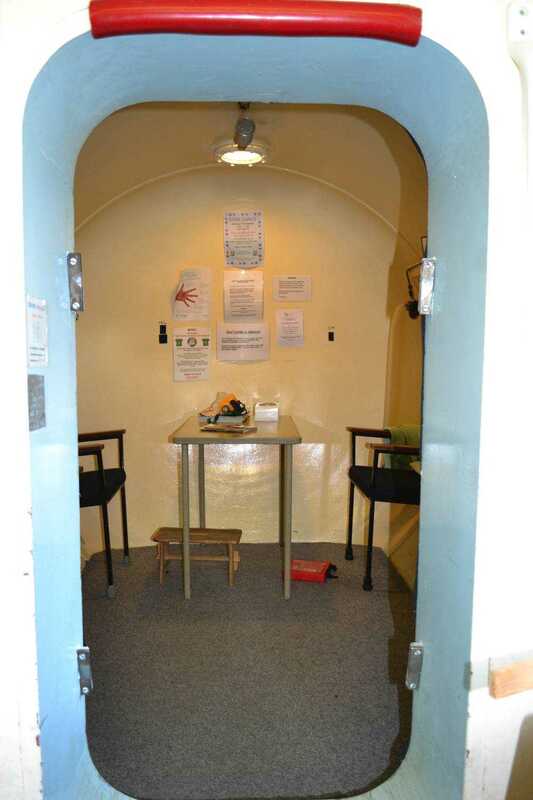 Luckily a member of the police officer’s family was also an MS sufferer – Norway apparently has the highest number of MS sufferers, so he escaped a ban, a jail sentence and a huge fine. 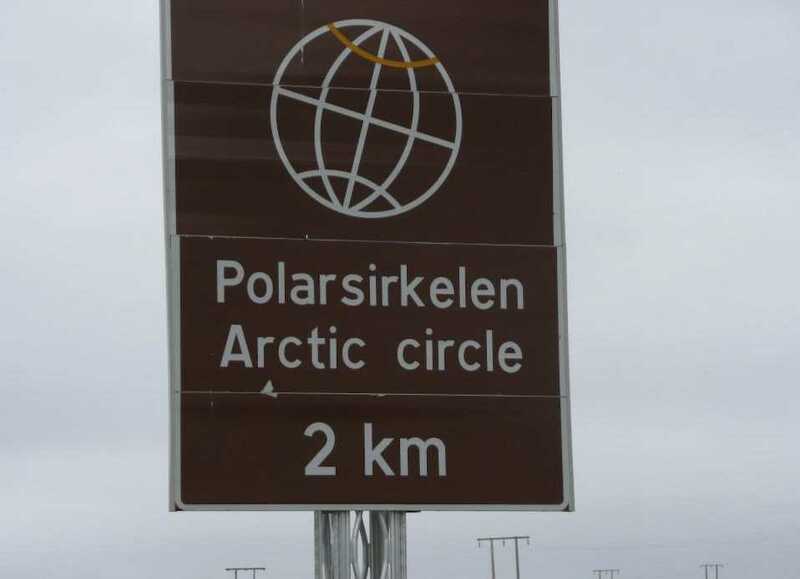 On visiting the Arctic Raceway a Steve was once again able to put his suspension skills to good use on a GSXR 1000, helping the struggling rider to get pole position. He went on to win the race! I asked Steve if his MS was getting worse, and how he sees things being in ten years time. 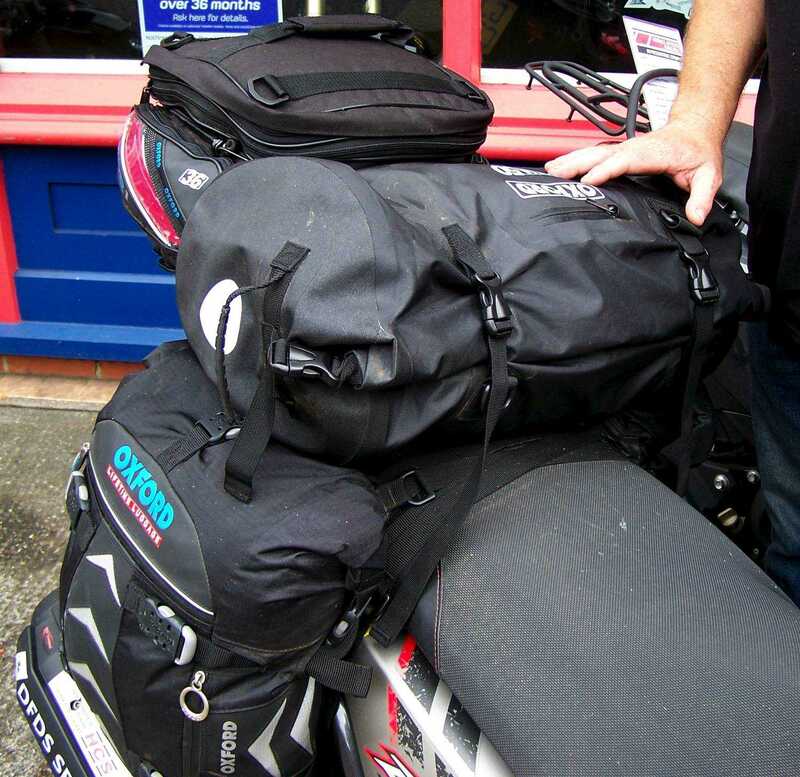 But first Steve needed to ride to southern Spain and back. As we met at the Kent Multiple Sclerosis Therapy Centre, the send off seemed remarkably low key. It was Steve making the tea and handing out the biscuits. Steve’s partner Denise, a fellow sufferer who helps organise the rides was there along with her daughter, as well as Tony Dunderdale, Steve’s modest but possibly most generous sponsor, from The Bike Shop. As we waved him off on that sunny summer’s day few of us had any idea of the challenges he would face during the trip. I’d arranged to interview him on his return, but such is the unpredictable nature of Steve’s condition that he hasn’t been well enough to meet up. He is currently struggling to walk and using crutches. Next month: The Sierra Nevada and back. What a fantastic story. 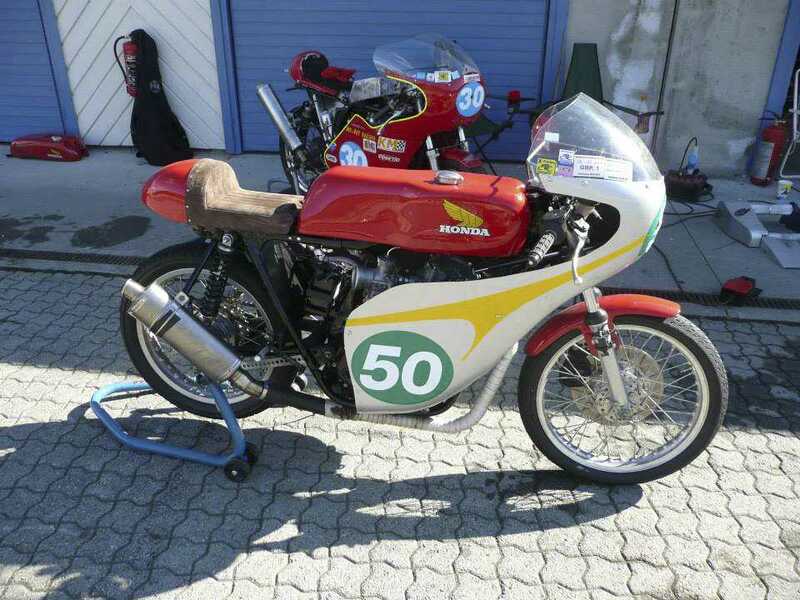 And there’s me thinking about whether to do a run to Paris on the MZ. I’ve got 250cc, both my legs work and it’s only 300 miles. Makes me feel like a wimp! A very interesting story and a great telling of it. Well done, Martin, as always. If I am at home in France when he next comes through I will give him a place to stay. What an inspiring bloke. 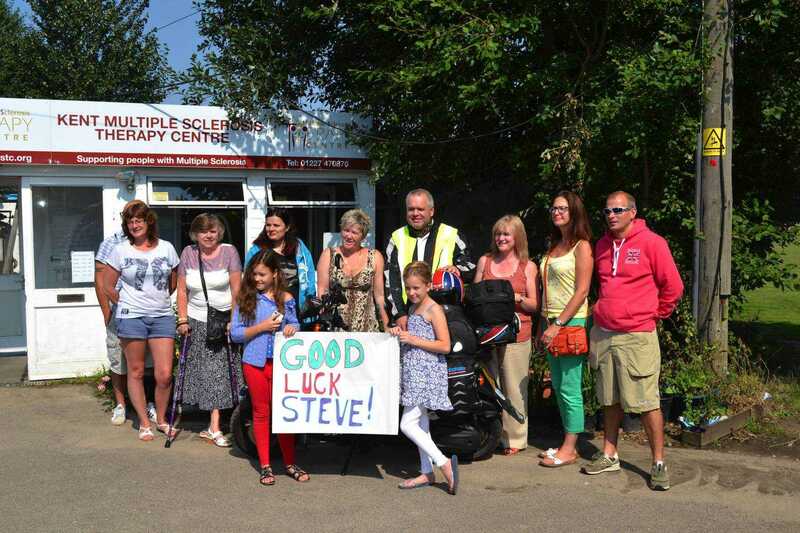 As an avid biker first and foremost, and also an MS sufferer, i have so much respect for Steve, this story is so inspirational not only for people who suffer from ANY form of disability, but for all those without. I try to ride everyday whenever i feel its possible, and get sick and tired of small minded people telling me ” you can’t ride with MS”, well i’m in the same frame of mind as Steve, keep going as long as i/you can. Well done Steve, top respect to a top bloke. RESPECT! My father was diagnosed with MS and had to take medical retirement at age 58. He kept as active as he could until his condition took away all limb control 7 years ago at which point he became totally reliant on mother, carers and the family. He died at the age of 80 just before Christmas 2012. His ambition had been travel widely around the UK and Europe but that was never realised because he was a lorry driver and his driving lisence was revoked when he was retired. 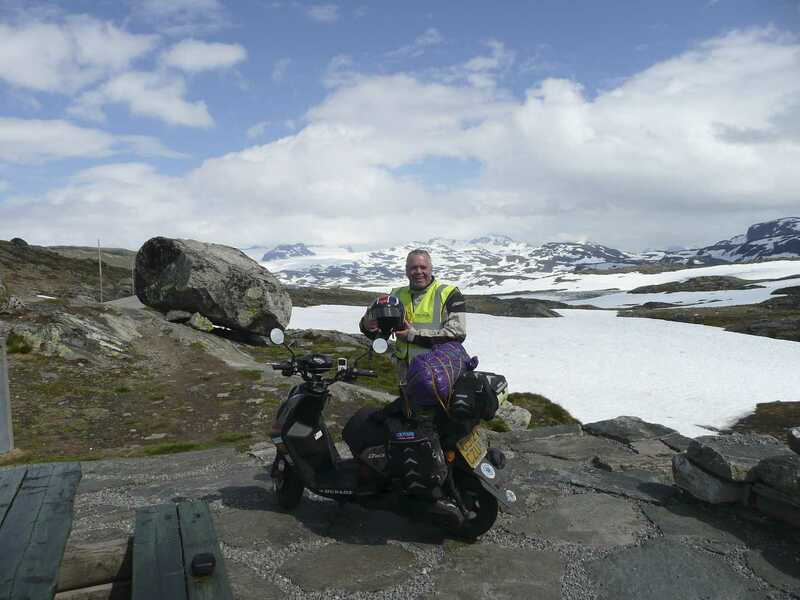 Steve, your storey is amazing and I hope you get to complete many more trips. I have been in touch with Steve, after a relapse which had him on crutches for a while he has been warming his bones in Spain. 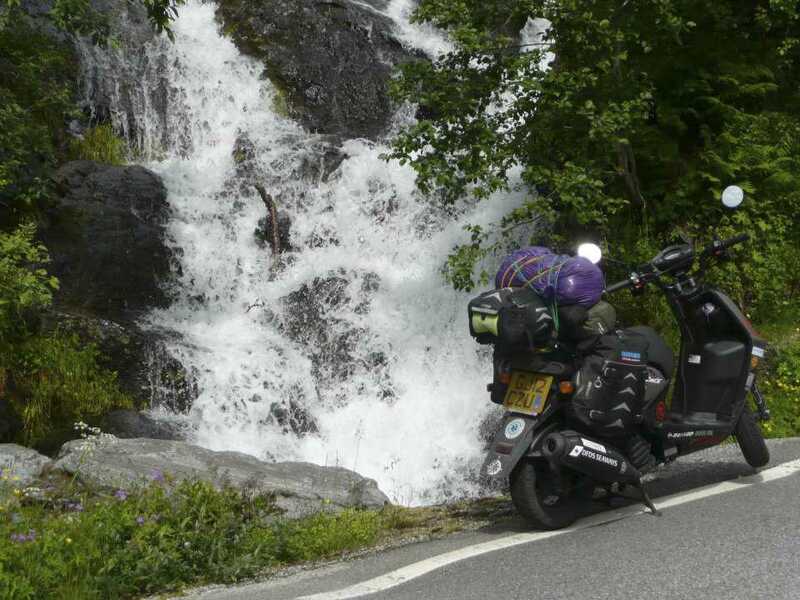 We will be meeting up later in May to find out what happened on the ride to Spain and the trip to Holland. Watch this space! It’s been a while since this article, hope he is doing ok.
Well,you have inspired me to try for a fundraiser for MS.On a 50cc. Just thought of it now. Haven’t even told the wife yet! I’ll have to plan for a winter trip, as 40 degree heat and ms don’t mix. I have RRMS. Had it since Feb this year, sudden onset and severe too. Ah well, I am beating it! 57 years old, gotta do something! I an in a chair just now, but a new drug – Rituximab is having great effects, I am starting on forearm crutches right now.